The American Civil War was a war to end slavery. That was the key issue, as was my understanding. The thirteenth Amendment to the US Constitution made slavery in the United States illegal. These things happened around the same time; they were related to each other, but not actually connected. Who knew? Not me. 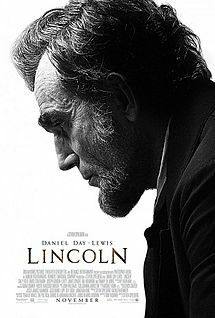 The film Lincoln follows US President Abraham Lincoln in his second term as President as he and his colleagues work to get the amendment passed. It’s not a rip-roaring action flick – if you want to see a film relating to slavery that is, see Django Unchained. This is a political drama, and for that reason, it’s pretty slow-paced and borders on boring. What stops it from being boring? I think for me it was the fact this was such an important moment in the world, deciding on the level of humanity to be shown to a group of people. Yet, it was all decided in such a political way, with votes being bought with jobs and political promises. Politics – such a dirty business. Daniel Day-Lewis is an actor notorious for his research into his roles, so I believe that he did a lot of work to bring Lincoln to life as much as possible. Still, I find it hard to believe that he walked with such an unusual gait – it made him look like some kind of a puppet, and really distracted me from the importance of the story at hand. I felt as though the story structure was a bit misguided at times; for me, the story was the politics. There were other parts that were connected in some way, but not totally crucial that the story would not have suffered if they had been left out of the film. For me, the whole storyline involving Lincoln’s son, Robert, was not all that relevant. Of course, that would mean losing Joseph Gordon-Levitt from the cast, but it wasn’t the most exciting role anyhow. He’s done lots better. Overall, I enjoyed the film, but I don’t think it was necessarily worthy of the many nominations it has received. I sometimes wonder if you get a cast like this with a story of such great importance to the US directed by Steven Spielberg and it would be considered wrong for it to not be nominated. Is this how awards work?